It’s a “Chinese Menu” embedded inside … a Chinese menu. Turns out most of the food featured on Chinese takeout menus is actually American cuisine, invented right here in the states, by immigrants. And the hidden “Chinese Menu”? Well, those are dishes made from recipes that originated in China. We set out to learn more about Chinese-American food and identity in our video series, Chinese Food: An All-American Cuisine. The journey took us from the oldest Chinatown in San Francisco to the Mississippi Delta and back to California’s San Gabriel Valley, a cluster of majority Asian suburbs east of Los Angeles.We also discovered that those two menus above can tell us a lot about the history of Chinese immigration to the U.S. The first wave of Chinese immigrants came to California during the Gold Rush in the 1850s, and they’ve faced discrimination almost since they arrived. The Chinese Exclusion Act of 1882, for example, prohibited Chinese immigrants from doing the same jobs as white Americans, since Chinese people were deemed non-citizens; faced with few options, immigrants had to get creative in order to survive. Some started restaurants, despite the fact that many of them had little to no kitchen training. The earliest wave of Chinese food (meaning old-school dishes like chop suey, egg foo young and lo mein) were actually American inventions based on Toisan and Cantonese recipes, since the majority of immigrants who came during the Gold Rush came from these regions of China. 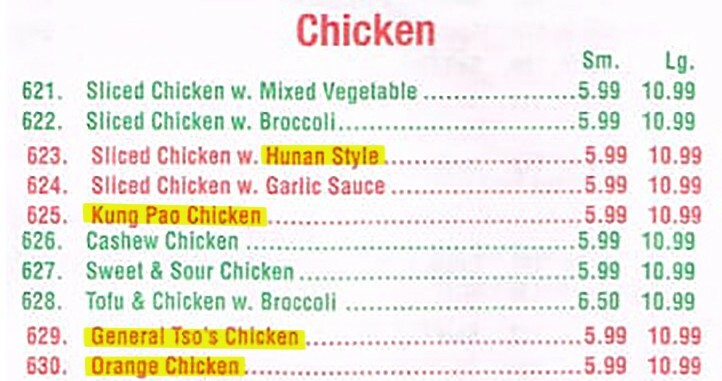 It’s important to note that Chinese restaurants made dishes catered to the palates of the very same Americans who didn’t want them to be part of their society. It was a strategic move — making their food, and by extension, their culture, more palatable and less threatening to white Americans. This is why you’ll see things like lo mein listed on the regular section of a Chinese takeout menu. Turns out, lo mein is a Cantonese-inspired American dish. 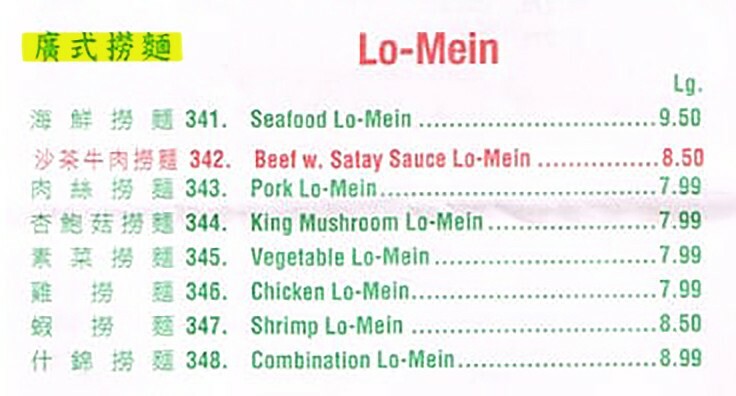 Another insider secret: Even the Chinese description for lo mein on Lai-Lai Wok’s menu above is written as 廣式撈麵, which literally translates to “Cantonese-Style Lo Mein” — proof of the lasting impact that old-school Cantonese-American dishes had on takeout cuisine. It wasn’t until the Immigration Act of 1965 (enacted in 1968) that all restrictions for Chinese immigrants, including quotas, were repealed. At that point, people from other regions of China started immigrating to the U.S. Rather than just coming from Toisan and Guangdong, people started coming from places like Taiwan and Hong Kong. Up to 20,000 immigrants from East Asian countries were allowed into the U.S. each year. This second wave of Chinese immigration brought flavors from Hunan and Szechuan, making Chinese-American food spicier, saucier and more deep-fried. By 1973, Panda Inn, the first Panda Express, opened. Starting around 1990, China’s economy really took off. GDP per capita rose in an unprecedented way, and a lot of people became rich. I chose to feature a menu from Lai-Lai Wok, a Chinese restaurant in Champaign, Illinois, because this college town has become a hub for authentic Chinese food thanks to all the Chinese international students attending the University of Illinois (a university that gives the largest number of visas to Chinese international students). This change in immigration and campus makeup has not only transformed the food scene in college towns like Champaign, it’s also transformed entire cities and suburbs like the San Gabriel Valley, where we wrapped up the last segment of our Chinese Food series. Kung pao chicken, lo mein, crab rangoon and chop suey are American dishes. There’s a “Chinese Menu” embedded in this takeout menu because Chinese-American cuisine is evolving to finally include “authentic” Chinese food as an option. Years of racist immigration laws prevented many people from coming to America and therefore limited our Chinese food options here. Check out our series: Chinese Food: An All-American Cuisine. It includes a half hour’s worth of footage of Chinese food, immigration stories and more insider knowledge. Warning: You will get hungry. Watch, discuss and share with your favorite Chinese food lovers. AJ+ is a global news community that highlights human struggles and achievements, empowers impassioned voices, and challenges the status quo. Here, we take a deeper look at the stories you are following.